It’s that time of the year again, where studios are warming up for next year’s TV season, producing pilots they hope will become the next big hit. Somehow some of these pilot always turns up on the internetz, be it intentionally or not. I’ll try to review the ones I come across, giving feedback if it’s worth watching next fall or not. The first is The Mentalist, a CBS produced police drama, starring Simon Baker (The Guardian). He plays Patrick Jane, a consultant for the California Bureau of Investigation (CBI), who uses his remarkable skills of observation to help solve cases. Five years ago Jane was a TV celebrity psychic, who was involved in the hunt for the serial killer Red John. On TV he (falsely) claimed he could feel Red John with his paranormal abilities and Red John responded by killing Jane’s family. Since then he’s stopped with the psychic angle, admitting his powers were fake, and started working as a crime consultant. Jane is known for his lack of protocol and his unusual method of solving cases, infuriating his senior agent Teresa Lisbon (Robin Tunney) and the other members of the team (Owain Yeoman, Amanda Righetti and Tim Kang). When I heard the premise of this series, I thought it would be a Psych/Monk rip-off. It’s not though, not at all. Where Psych and Monk are both pretty upbeat and funny, The Mentalist is more darker and serious than those two series. It has a bit of the same base story, but in the execution they’re nothing alike. The character of Patrick Jane can be funny at times, but his circumstances and background are painted more seriously, giving him a rougher, more realistic edge. Patrick Jane is the type of person who knows he’s the smartest person in the room and will remind you of that very fact. He’s arrogant and slightly annoying to most of the people he shares the screen with. 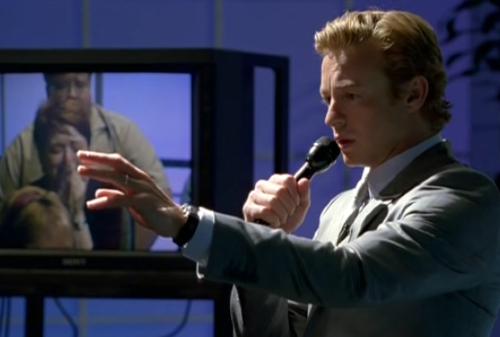 In another actor’s hands this could have turned out bad, but Simon Baker makes it work; you actually start liking him. He’s a great lead and you’re straight away rooting for his character. 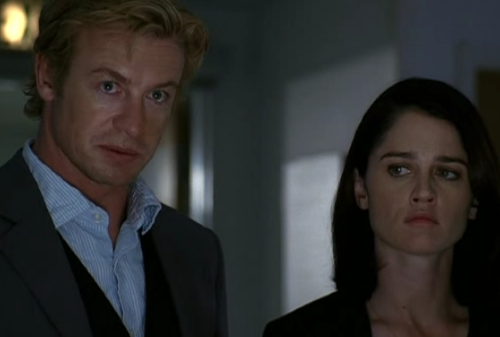 Robin Tunney, who I typically find quite annoying, is decent enough as Jane’s supervisor. The other supporting characters are all okay, even though we don’t get to see much of them in this pilot. It’s great to see Owain Yeoman again on TV, but his track records with new series haven’t fared that well (both The Nine and Kitchen Confidential were cancelled after 13 episodes). And the same counts for Amanda Righetti (Reunion got cancelled after 13 episodes too). Fingers crossed The Mentalist doesn’t go down that same road. The Mentalist is an interesting new series that doesn’t require too much effort to get into. Most episodes will be stand-alone and I’m guessing the light season story arch of Red John will not frighten off the occasional viewer. Additionally, it’s an easy series to commit to; there’s no real mystery and mythology to get hooked by, and if the series does get cancelled, there won’t be too many never-to-be-solved loose ends. I’m not sure if they’ll stick to this pilot; there’s always the chance they’ll recast, rewrite and reshoot certain stuff. I liked it though, and it’s going on my to-watch for this fall.